During my time studying the Nordic region, I have become more and more curious about the country of Greenland. While I was studying Icelandic, I read somewhere that Greenland was discovered by a Viking named Erik the Red, who had been sent away from both Norway and Iceland because of his crimes. When he found Greenland, he discovered that it had a great many resources and sailed back to Iceland in order to spread the news about "The Green Land". According to their tourist website, on visiting Greenland you will have the opportunity to see many wild animals in their natural habitat. 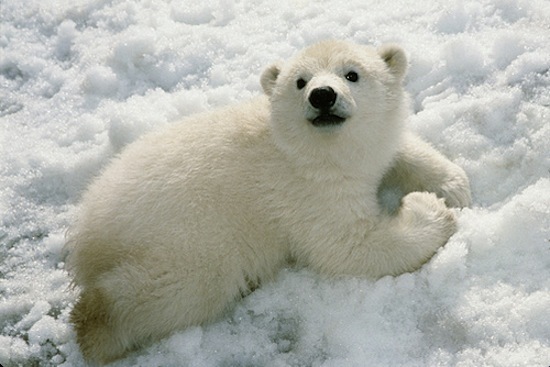 The biggest predator is the Polar Bear – can you imagine seeing one of these in the wild? He doesn't look much like a predator! 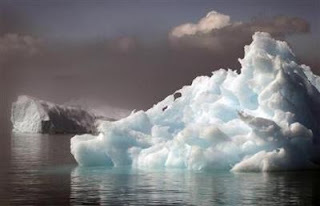 It is possible to take a boat trip, through the icebergs to see the midnight sun. Have you ever experienced this before? Up in the cabin I mentioned a couple of days ago, it is very light during the summer months. It does get fairly dark in the middle of the night, but it only really reaches twilight, before getting lighter again. The picture below was taken out of one of the windows, around 11:30pm. It’s a really strange experience, sitting out in the sunshine with a glass of wine, casually glancing at the clock and discovering that it’s nearly midnight! While I was doing some research for this post, I came across quite a lot of information about the Ice-Sheet. I then found what I think is such a beautiful description of this: “Wherever the Ice Sheet meets the sea or a fjord, icebergs are born. The sea is whipped up, the swell rises, a huge lump of ice tumbles into the water, finds its equilibrium and floats in a sedate tempo out to sea, where icebergs in all shapes and sizes create a wonderful, ever-changing island realm.” - this was taken from the tourist website, that I linked to above. Can you imagine having the opportunity to see this? 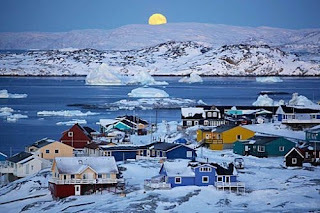 I have never been lucky enough to visit Greenland, but in my mind, it is just the most stunningly beautiful place! But with all of it’s beauty and wonder comes a great sadness, and that is the fact that if we do not take care of our planet, it will be gone. It worries me that places like this are coming closer and closer to destruction with the passing of years and the problem with climate change. It makes me want to run away and see all of this breath-taking scenery while I still have the chance! Happy Easter to all of you. I will be visiting you shortly. I've just stepped off of the train and am feeling very sleepy, but I can't wait to read your posts for today! Ooh, beautiful images and info. I love learning! Happy Easter, too! I would love to see both Greenland and Iceland! another glorious respite. thank you! And Pleeae DO tell me more about that little RABBIT! My grandfather was stationed in Greenland when he was in the air force, and he tells us some wonderful stories about it. My travel wish list is growing and growing. I love your posts. You have such wonderful information and beautiful photographs. It is a pleasure to read what you write. Thank you. Thanks for sharing, who knew? I read a great book about Erik the Red and the founding of Greenland. I've been interested in it ever since. Great posts and great pictures. It sounds like an amazing place but maybe a bit too cold! I don't know much about Greenland but it seems like a bleak,foreboding place. Hope you can prove me wrong. Eric the Red--had to have had red hair. Many Vikings did and you see many red-heads or Ginger Hair in the UK, and in the places that the Vikings explored, Russia too. It would be interesting to visit Greenland and Iceland. Always find you blogs interesting. I look forward to reading them every day. A blessed Easter to you, too. First--what beautiful pictures. And that polar bear is so cute! He in no way looks like a predator. And I have experienced the sky being light at close to midnight--when we were in Scotland in July one year and Alaska in June another year. It is a strange feeling. I haven't visited Greenland but it sounds very interesting. Happy Easter to you too, Nikki. Greenland seems like a nice place to visit. Your pictures make it look very magical. Beautiful pictures. The polar bear looks pretty scary! A truly wonderful post. I love that bear! looks cuddly but I'm not sure I'd like to try.. I wonder if I lived in Greenland in a former life because I often have this dream about the sun being out at midnight. Maybe I should go check with Freud. Love the bear--that picture makes me want to rub its little tummy. I have always wanted to visit Greenland, thank you for sharing this post. I am so impressed that you know Icelandic! I love it when people learn different languages rather than French and the usual. I'm going to cuddle that polar bear cub until he claws my face off. Slightly more on topic: I think both Iceland and Greenland are a few of the most beautiful places on Earth. That's some amazing photography & information. Wish to visit Greenland sometime. Thanks too for dropping by my blog & comment. Nice to see you as part of the #AtoZChallenge. Good Luck! !